On the search for an ultra-flattering swimsuit? Belted bikinis and one-piece suits are staking their claim as an It silhouette this season. Sporty and sleek, versions come ribbed, striped, printed, and crocheted, drawing in at the midsection to create a feminine shape. “It’s all about a cinched waist for spring so the translation into swimwear for summer makes perfect sense,” says Roopal Patel, fashion director at Saks Fifth Avenue. More than flattering, belted swimwear is versatile for a fashion-forward look beyond the beach. “Women treat one-piece bathing suits the same way that they’d treat a bodysuit,” Patel explains. “They’re transitional and serve as a great beach-to-lunch look. 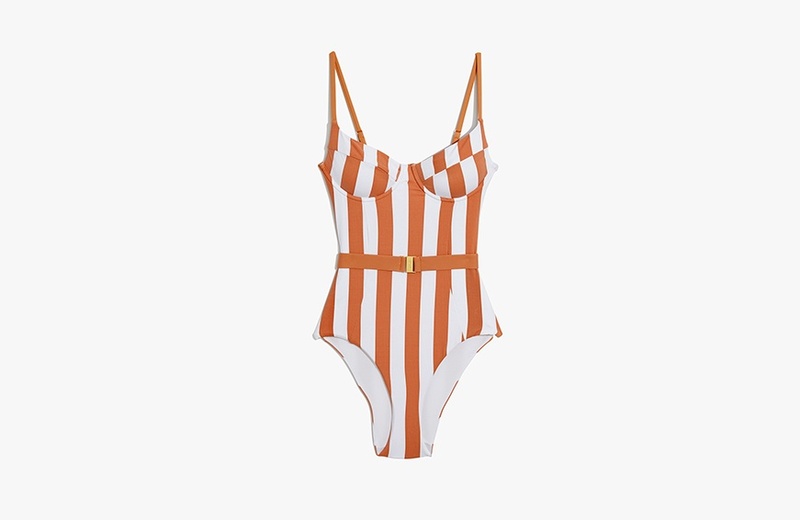 One-pieces can be easily paired [with] wrap skirts.” Here are 14 belted swimsuits to shop now, from sporty to retro to frilled. This neat leotard silhouette puts a modern spin on retro. At the beach or on the street, accessorize your new suit with a pair of hoop earrings and summer-white sneakers to pull together a look with serious cool factor.